Estoppel is the law's way of saying "you can't have your cake and eat it." "A man shall not be allowed to blow hot and cold - to affirm at one time and deny at another - making a claim on those to whom he has deluded to their disadvantage, and founding that claim on the very matters of the delusion." "An estoppel ... happens where a man hath done some act or executed some deed which estops or precludes him from averring any thing to the contrary. "... a rule of evidence which precludes a person from denying the truth of some statement previously made by himself". "... if a man, whatever his real meaning may be, so conducts himself that a reasonable man would take his conduct to mean a certain representation of facts, and that it was a true representation, and that the latter was intended to act upon it in a particular way, and he with such belief does act in that way to his damage, the first is estopped from denying that the facts were as represented." "... the word estoppel only means stopped. You will find it explained by Coke. It was brought over by the Normans. They used the old French estoupail. That meant a bung or cork by which you stopped something from coming out. It was in common use in our courts when they carried on all their proceedings in Norman-French. "Littleton writes in the law-French of his day (15th Century) using the words pur ceo que le baron est estoppe a dire ceo; meaning simply that the husband is stopped from saying something. "From that simple origin there has been built up over the centuries in our law a big house with many rooms. 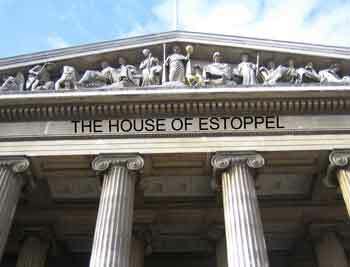 It is the house called Estoppel. "In (Edward) Coke's time, it was a small house with only three rooms, namely estoppel by matter of record, by matter of writing and by matter 'in pais'. But by our time, we have so many rooms that we are apt to get confused between them. Estoppel per rem judicatum, issue estoppel, estoppel by deed, estoppel by representation, estoppel by conduct, estoppel by acquiescence, estoppel by election or waiver, estoppel by negligence, promissory estoppel, proprietary estoppel, and goodness knows what else. "These several rooms have this much in common: they are all under the same roof. Someone is stopped from saying something or other, or doing something or other, or contesting something or other. But each room is used differently from the others. If you go into one room, you will find a notice saying 'estoppel is only a rule of evidence'. If you go into another room you will find a different notice: 'estoppel can give rise to a cause of action'. "Each room has its own separate notices. It is a mistake to suppose that what you find in one room, you will find in the others." McIlkenny v Chief Constable of West Midlands,  All ER 227. W. Malcolm McKay Co. v British American Co.,  SCR 335.